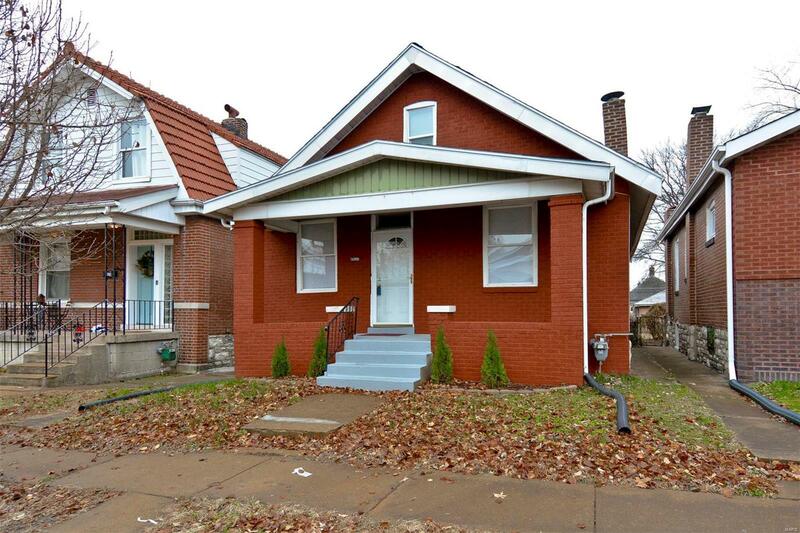 This charming 3 bed 1 bath full brick story an a half home with almost 1000 Sq.Ft. total living area is located in the Bevo Mill area. Enter from the front porch into the beautiful great room with stained glass windows. The dining room with ceiling fan connects from the Great Room through a beautiful arched entry way. The recently updated kitchen features newer counter tops, tile flooring, stainless steel smooth top range & refrigerator. Main-floor also has a bedroom with stained glass windows & updated full bath. Upstairs find two large bedrooms with newer carpet. This home has a walk-out basement & fenced back yard. Other features include newer engineered wood flooring in the main floor bedroom, dining room & great room, some newer six panel doors, wood trim, front storm door & some newer windows, freshly painted. Seller has received City Conservation Letter for occupancy. Property is being sold in its present "As-Is" condition. Seller to do no repairs or inspections.